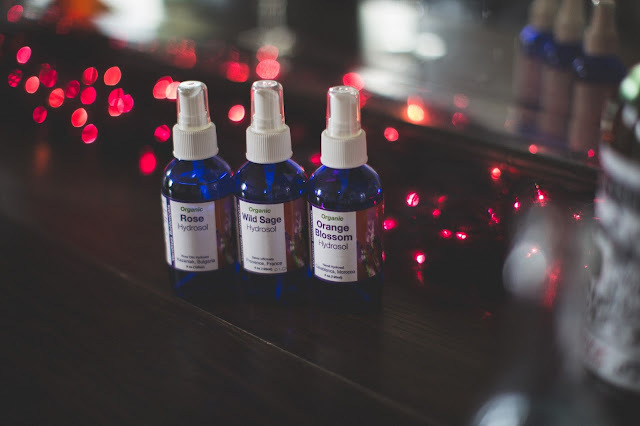 You might remember them from our first ever #LEARNABOUT article, or you can be reminded by what this blog is actually named after (rosewater), hydrosol is a class of water-soluble herbal distillates, usually hidden under the shadows of essential oils. Not today! 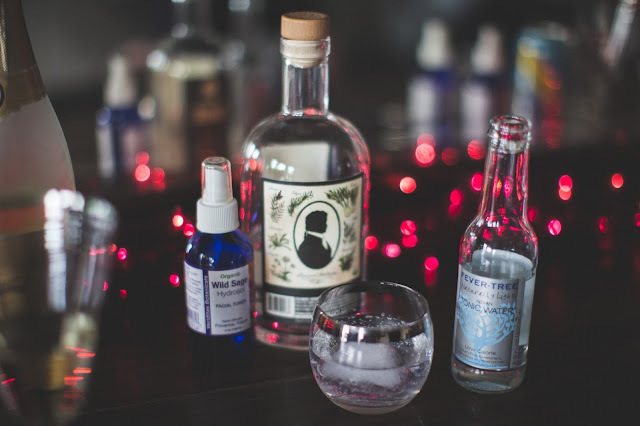 In this issue of Chef Says, Neuroscientist/University of Minnesota Medical Device Center Innovation Fellow, Dr. Anastasia Zink, will teach you how to incorporate hydrosols in your holiday and daily mixology! This article is written by Dr. Zink, and photographed by me. Using hydrosols is an easy way to introduce subtle or bold flavors into your cocktails. By their nature, the water-soluble flavor components dissolved in the hydrosol will easily mix into the water portion of your drink. I’ll walk you through my thought process of building the perfect champagne brunch cocktail. When drinking hydrosols, it’s easy to go from aromatic compliment to perfume-y punch in the nose. Luckily, I’ve done the systematic testing (so you don’t have to!) and found a nice balance in the recipes below. I keep a few different hydrosols on hand so I started by narrowing down my selection. When I test recipe ingredients, I like to compare each side by side, with the same ingredients in order to reduce variability that could be introduced from tasting each one at different times or with different ingredients (In a future #LEARNABOUT article, we will explore how our senses and perceptions of taste and smell can change with time, temperature, and experience!). You can choose any kind of sparkling white wine or Champagne (depending on your palate and pocketbook, of course). I prefer a nicely chilled Cava for this application but any semi-dry effervescent liquid will do. Try spritzing up plain soda water in a pinch! Rosewater or Orange Blossom Water? Rosewater hydrosol is much more forward in the nose than orange blossom water. To adjust, I use half the amount compared to orange blossom water. The goal is to compliment the flavor of the wine without overwhelming it. I find the floral notes of the hydrosol are prominent, like a nice bouquet. 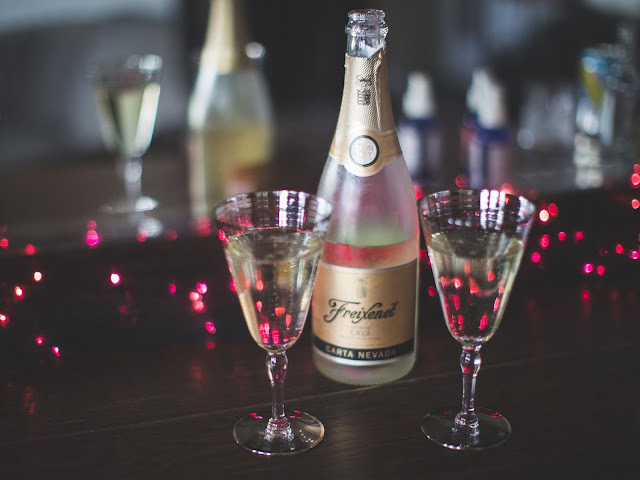 Pour the hydrosol into the bottom of a champagne flute or tall stemmed glass followed by the sparkling white wine. Give one stir around the glass, careful not to disturb too much of the carbonation. Serve immediately. Just like the rosewater champagne cocktail, pour the hydrosol into the bottom of a champagne glass followed by the sparkling white wine. Give one stir around the glass. Both are sure hits on a chic brunch menu. I love the rose scent on its own with the fruity notes of the wine. But… not quite the show stopper I was looking for as my brunch’s feature cocktail. I need a base to build on, so I went with the orange blossom water. There was a chance the rosewater’s strong presence would be difficult to pair well with other flavor components. The orange blossom water also opened the possibility of replacing a traditional orange or citrus ingredient in a classic cocktail with something more soft and subtle, as orange blossom water lacks the signature citrusy zestiness, but has a more prominent bittersweet nuttiness. One of my favorite champagne cocktails is credited to the in/famous writer, Earnest Hemingway. 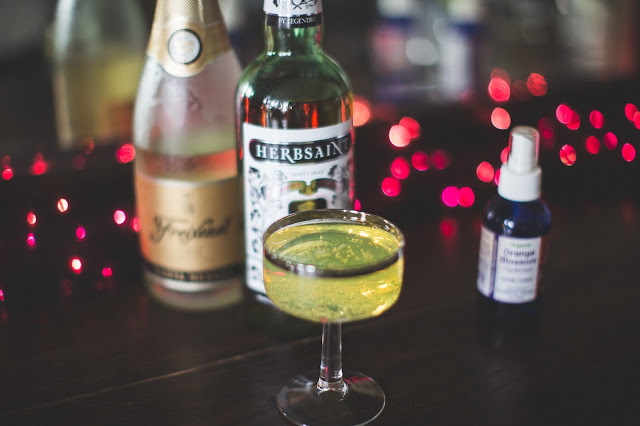 At its inception, it consisted simply of roughly 1 part Absinthe to 3 parts iced Champagne, or “until it attains the proper opalescent milkiness” (Sterling North’s 1935 book So Red the Nose, or, Breath in the Afternoon; http://www.kitchenriffs.com/2014/01/the-death-in-afternoon-cocktail.html). Louching is the process of molecules precipitating out of a clear liquid or solution that has changed composition, typically, when water dilutes the alcohol content. Some molecules dissolve better in alcohol than in water. 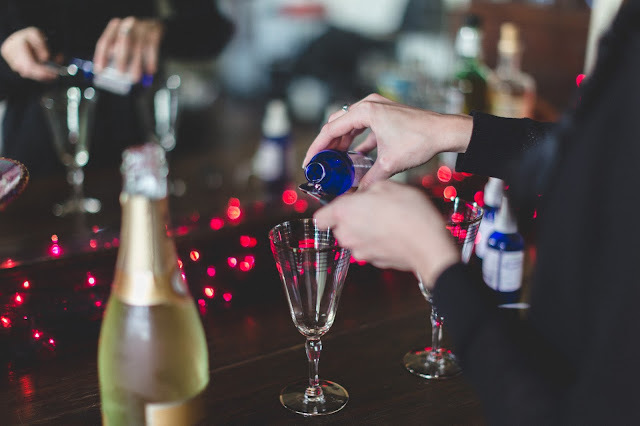 When the alcohol percentage drops, the alcohol-preferring molecules are no longer able to stay dissolved and turn from liquid into small crystals. These crystals scatter the light traveling through the solution, which gives off a milky or opaque appearance. Absinthe is an anise-flavored liqueur that, much like the author mentioned above, has garnered a less-than-dignified reputation over the years. In the case of the liqueur, it was mostly unwarranted. Absinthe’s primary fault being that the candy-like deliciousness is enough to fool any unsuspecting drinker into forgetting the 80-100 proof alcohol content. History aside, absinthe and related liqueurs (e.g. 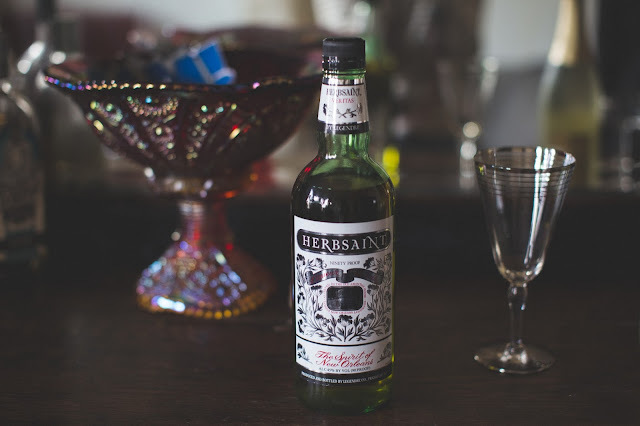 Pastis and Herbsaint) provide a wonderful herbal licorice flavor that is unlike any of the sticky black candies your auntie tried to give you as a kid. Pour the hydrosol and anise liqueur into the bottom of a glass followed by the sparkling white wine. Give one stir around the glass, careful not to disturb too much of the carbonation. Serve immediately. You needn’t fear the green fairy will make a visit. Just sit back with your guests and enjoy the flavors and aromas that play on your palate. I've walked you through some cocktail recipes that tend toward the sweet side. What about a beverage for the savory palate? Gin offers a distinct herbaceousness and is known for its punchy, peppery bite. Gin at its most basic is an alcoholic distillate infused with juniper berries and aromatics. 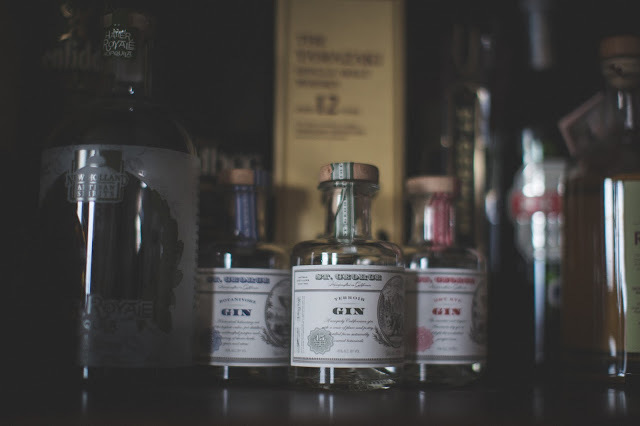 Some styles of gin use lots of juniper and have much stronger pepper notes, while others emphasize the herbal or aromatic components and typically have more mild, earthy flavor profiles. 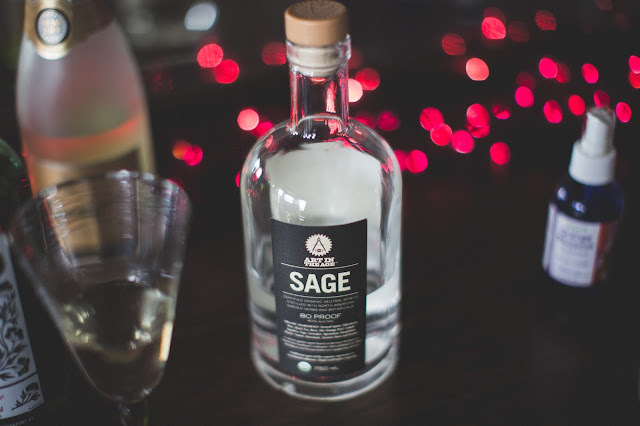 The recipe below incorporates multiple sage sources, both from the hydrosol and from the spirit. Put ice in a low ball glass (the short, squat kind your grandpa likes for his scotch). Pour in the hydrosol and gin. Give one stir around the glass. Add one or two shots of tonic water (depending on how strong you like your drink). Serve immediately. These cocktails offer an easy way to infuse fantastic tastes and aromas into your party menu. Give your guests the sense of walking through flowering orchards or earthen sage brush. When planning a menu and testing recipes, the goal is to create a sensory memory. These certainly deliver. Cheers! "Life is one long experiment. Keep testing new things!" 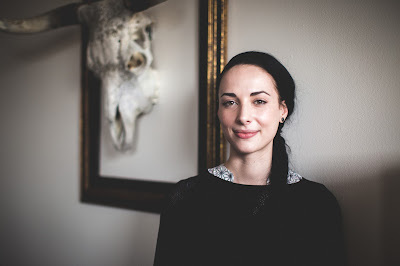 Dr, Anastasia Zink is a Minneapolis neuroscientist turned inventor with strong foodie roots. She completed her PhD in 2015 from the University of Minnesota. Dr. Zink relishes her free time, spending her evenings enjoying the arts, music, food, and drink. She has been hosting cocktail parties in her home for years, taking pleasure in creating custom cocktail menus to serve her guests. She’s no stranger to experimenting in the lab, the kitchen, and the bar, bringing a touch of creativity to all. You can follow her on twitter: @anastasiazink.